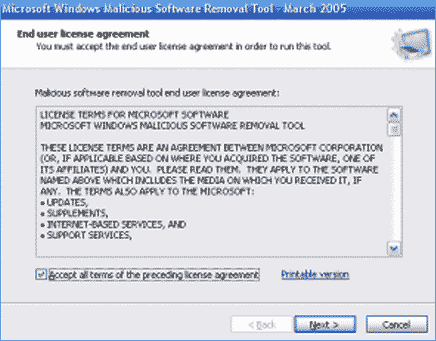 Windows Malicious Software Removal Tool is a free tool from Microsoft that checks your Windows based computer for infections. It helps detect prevalent malicious software (including Blaster, Sasser, and Mydoom) and also assist in removing the infection. This tools is not replacement for your Anti-Virus and Anti-Spyware software. Infact, it is an add-on to check for specific infections and remove them. Even if your computer is working normal, Microsoft advises to use this tool to stay clean and updated from malicious infections. Microsoft regularly updates this tool so that new infections can be easily detected and removed. It is available for free download for Windows 2000, XP and Vista computer. Give extra layer of security to your computer with Microsoft malicious software removal tool [x64 version ]. I have never tried out this tool from Microsoft.